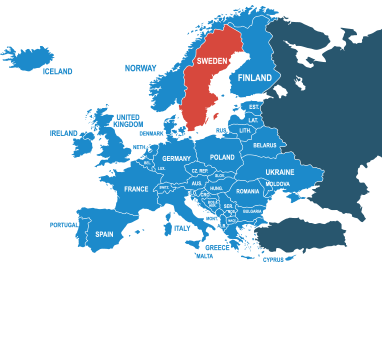 One of the largest countries in Europe, arranging to send your parcel to Sweden with DPD Local Online means that you’re getting cheap parcel delivery with no loss of service. A sparsely populated country which is known for its long coastline, dense forests and spectacular lakes, Sweden is a country of extreme contrasts; in particular its famously long summer days and seemingly endless winter nights. Whether you’re sending a parcel to the cosmopolitan city of Stockholm or somewhere much more remote, our extensive courier delivery network will ensure that, if you’re sending a parcel to Sweden, it will arrive when you need it to. Arranging postage to Sweden is easy with our range of express and economy parcel delivery services. Just complete our simple online form and we’ll give you an instant quote. We are proud to offer some of the best options when it comes to postage to Sweden, and will guarantee to get your parcel there quickly, safely and easily. Book your parcel to Sweden with DPD Local Online today. Do I need to deal with customs when sending from the UK to Sweden? Luckily, Sweden has been a member of the European Union for the last twenty years, meaning that when you’re posting to Sweden from the UK don’t have to worry about having to deal with customs duties when posting a parcel there. How much does it cost to send a parcel from the UK to Sweden? When you book through DPDLocal-Online, postage to Sweden can cost as little as £15.00. You’ll find that we’ll always give you the best options at prices that you’ll struggle to beat. That’s because we strive to ensure you save as much as possible. Plus, you’ll get even better discounts when you take advantage of our bulk shipping options. How should I address my parcel for delivery to Sweden? The main feature you’ll need to be aware of when addressing a parcel to Sweden is that the postal service require what’s called an ISO-2 country code for international deliveries. If that sounds confusing, don’t worry: it’s all explained in this useful addressing guide put together by the Universal Postal Union. We recommend contacting the Swedish Post Office if you’re sending any items you’re unsure about, as well as checking out our prohibited items page.